Féileacán is the most difficult of the three beginners’ tunes to understand. For Mailí Bhán and for Burns’s March, we have clear and unambiguous field draft notations from the playing of Patrick Quin, which point us to straightforward solutions to how to play those two tunes on the harp. We have variants also from the Examples sheet, which are also fairly straightforward to understand, as I showed in yesterday’s post. But for Féileacán, we have no draft notation from Quin; the piano arrangement of his setting, and the cryptic comment in the draft manuscript leaves us with many questions. Féileacán is presented in the piano arrangement from Quin with “original harp bass”. But the way this is written in the piano score clearly refers only to the alternating passages in the second half; the bass in the first half of the Quin piano arrangement is not claimed to be a harp bass, and the bass notes and harmonies there look very pianistic. And when we turn to the Examples sheet, we again come upon a strange ambiguity. The title there says “Fealagon or Butterfly, 4th tune taught the young harpers, with original harp bass”. We have the second half with the familiar alternating bass motifs. But in the first half we find a bass that, while looking plausible for the harp, is actually two different basses written on top of each other. Bunting has written out a bass of continuous repeated G chords; but he has then scored out every other G chord and replaced it with an A chord, to give an alternating G – A bass sequence. I don’t understand this! Is this bass invented by him on the piano? (the other basses on this sheet seem genuine harp basses). Were both versions played to him by his unknown harper informant? Did he mis-remember and then correct himself? Did he write the harper’s bass but then reject it as too “crude”? I think it is interesting to look at the rests in Bunting’s notation and to think about “closed” playing style where all the notes are stopped. I am not managing this as well as I would like in my video! The bass hand position is less obvious in this tune; the requirement is to have all the notes of the second half available under the fingers, and to play the alternating G and A chords with minimum shifting of position, and to respect the spread hand positions seen in the portraits of the old harpers. 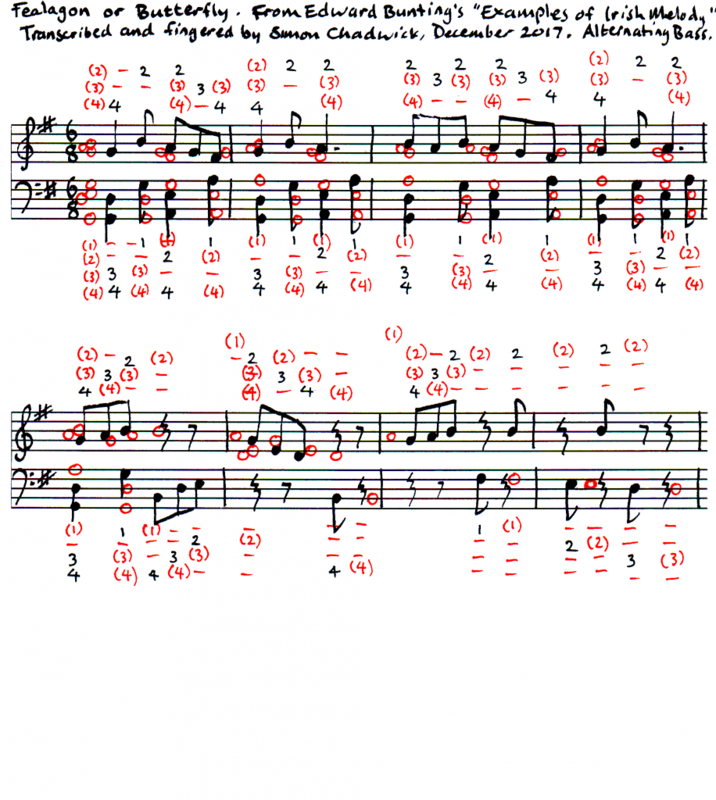 These attempts feed back into an understanding of the piano arrangement said to be from Patrick Quin. 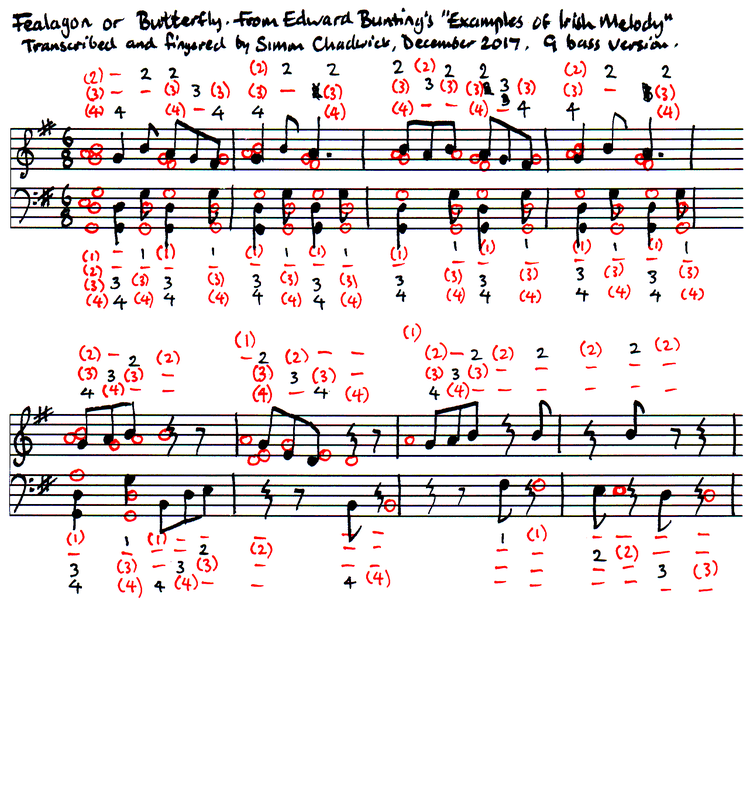 This version clearly has the left and right hands in seperate registers, like the Quin piano version, which throws doubt on the meaning of the comment “the treble of Fealagon is to be played an 8th lower”. And the fast alternating bass of the first half of the Examples version is reminiscent of the kind of movement seen in the Quin piano arrangement – though the harmonies of that piano score are very pianistic. So my playing on the demonstration video, and audio for my Progressive Lessons book earlier this year looks less plausible now. I am also thinking that these notations on the Examples sheet give us a very different view of early Irish harp harmonisation and performance practice, from what we have come to expect from the modern revival. I think there is a lot of scope for thinking again about how the old Irish harp tunes might be interpreted and played, based on this single sheet of paper in the Bunting manuscripts! 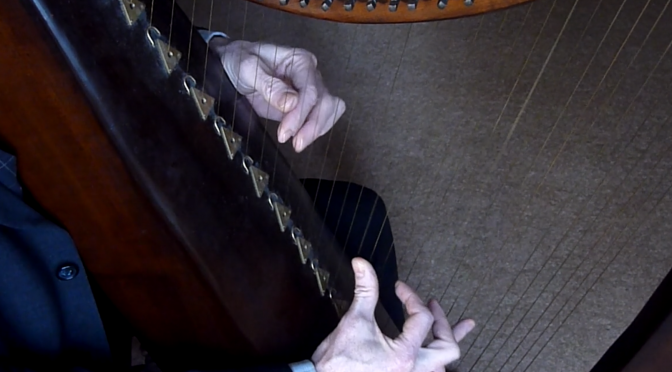 Thanks to the HHSI for the loan of the harp used in the videos, and to Queens University, Belfast, for supplying the facsimile of the Examples sheet and giving me permission to reproduce it full-size and full-colour in my Progressive Lessons book.